Thomas Ball (June 3, 1819 – December 11, 1911) was an American sculptor and musician. His work has had a marked influence on monumental art in the United States, especially in New England. He was born in Charlestown, Massachusetts, to Thomas Ball, a house and sign painter and Elizabeth Wyer Hall. His father died when he was twelve. After several odd jobs to help support his family he spent three years working at the Boston Museum, which he later described as a "place of amusement" rather than an art museum. There he entertained the visitors by drawing portraits, playing the violin, and singing, and repaired mechanical toys. He then became an apprentice for the museum wood-carver Abel Brown. He taught himself oil painting by copying prints and casts in the studio of the museum superintendent. His earliest work was a bust of Jenny Lind, whom he saw on her 1850 tour of the United States. Copies of his Lind work and his bust of Daniel Webster sold widely before being widely copied by others. His work includes many early cabinet busts of musicians. His first statue of a figure was a two-foot high statue of Daniel Webster, on which he worked from photographs and engravings until he managed to see him pass his studio shortly before his death. Ball was an accomplished musician and from his teenage years worked as a paid singer in Boston churches. He performed as an unpaid soloist with the Handel and Haydn Society beginning in 1846 and with that organization sang the title role in the first United States performance of Mendelssohn's Elijah, and the baritone solos in Rossini's Moses in Egypt. On a visit to Boston years later he performed the baritone role in Boston's first performance of Beethoven's Ninth Symphony with the Germania Orchestra on April 2, 1853. Daniel Webster (1868), Central Park, New York City. As commissions started to come in he moved from studio to studio until he settled in a studio in Tremont Row where he remained for twelve years. There he painted several religious pictures and a portrait of Cornelia Wells (Walter) Richards, editor of the Boston Evening Transcript. He then turned his attention to sculpture. Charles Sumner (1878), The Public Garden, Boston, Massachusetts. At thirty-five he went to Florence for study. Except for an interval of work in Boston, Massachusetts, in 1857–1865, he remained there until 1897 as a member of an artistic colony that included Robert and Elizabeth Barrett Browning and Hiram Powers. The notables he met in Europe included Franz Liszt, whom he met at the Vatican in 1865 and of whom he produced a portrait bust. He made it a practice never to attend the unveiling of any of his public works. Once in Boston he managed to avoid receiving the invitation to the ceremonial dedication of his statue of Gov. Andrew and instead went to see the work later, viewing it from different approaches. He later wrote: "It was a mean thing to do. I am ashamed of it now; but I could not bring myself to stand on that platform and face the multitude." Dartmouth College awarded him an honorary degree of Master of Arts. When he returned to America he lived in Montclair, New Jersey, while keeping a studio in New York City. In 1880, Ball published an autobiographical volume, My Threescore Years, which he updated in 1890 as My Three Score Years and Ten. Ball died at the Montclair home of his daughter, Eliza Chickering Ball, and son-in-law, sculptor William Couper. George Washington (1864), The Public Garden, Boston, Massachusetts. P. T. Barnum (1887), Seaside Park, Bridgeport, Connecticut. Bust of Jenny Lind (plaster, 1851), New York Historical Society, New York City. Bust of Daniel Webster (bronze), Hood Museum of Art, Dartmouth College, Hanover, New Hampshire. Statuette of Daniel Webster (bronze, 1853). Four bas-relief panels (bronze, 1856), on base of Richard Saltonstall Greenough's Benjamin Franklin statue, Old City Hall, Boston, Massachusetts. Statuette of Henry Clay (bronze, 1858), U.S. Senate Art Collection, U.S. Capitol, Washington, D.C.
Daniel Webster (bronze, 1860–68), Central Park, New York City. Equestrian Statue of George Washington (bronze, 1864), Boston Public Garden, Boston, Massachusetts. Bust of Edward Everett (marble, 1867), Boston Public Library, Boston, Massachusetts. Edwin Forrest as "Coriolanus" (marble, 1867), Walnut Street Theater, Philadelphia, Pennsylvania. Josiah Quincy (bronze, 1869), Old City Hall, Boston, Massachusetts. John Albion Andrew (marble, 1870), Doric Hall, Massachusetts State House, Boston, Massachusetts. "The Angel of Death Lifting the Veil from the Eyes of Faith" (Jonas Chickering Monument) (marble, 1872), Mount Auburn Cemetery, Cambridge, Massachusetts. Saint John the Evangelist (marble, 1875), Forest Hills Cemetery, Boston, Massachusetts. Replaced by a polymer replica, 2001. Copies of this are in the Smithsonian American Art Museum, Washington, D.C.; the Chrysler Museum of Art, Norfolk, Virginia; and the Montclair Art Museum, Montclair, New Jersey. Emancipation Memorial (bronze, 1875), Lincoln Park, Washington, D.C.
A copy of this is in Park Square, Boston, Massachusetts. Charles Sumner (bronze, 1878), Boston Public Garden, Boston, Massachusetts. Daniel Webster (bronze, 1885–86), New Hampshire State House, Concord, New Hampshire. The commission was first given to sculptor Martin Milmore, then to his brother. Ball took it over following the deaths of both Milmores. This has a different pose from his earlier Webster statues. P. T. Barnum (bronze, 1887), Seaside Park, Bridgeport, Connecticut. 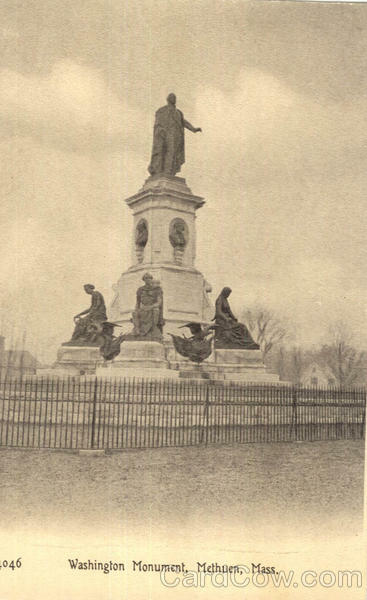 George Washington Monument (1883–93), Methuen, Massachusetts. This was Ball's most complex and ambitious work, consisting of a 15-foot bronze statue of Washington, 4 larger-than-life seated figures, 4 portrait busts, and 4 eagles flanked by flags, all displayed on a multi-tiered marble base. The monument was created at Ball's studio in Florence, Italy. His son-in-law, William Couper, assisted in modeling the figures. It was exhibited at the 1893 World Columbian Exposition in Chicago, Illinois, before being installed in Methuen, Massachusetts and dedicated on February 22, 1900. The monument was sold in 1958, disassembled, and moved to Forest Lawn Memorial Park, Hollywood Hills, California. Benjamin Franklin, Printer (1856), Old City Hall, Boston, Massachusetts. Edward Everett (1867), Boston Public Library, Boston, Massachusetts. Josiah Quincy (1869), Old City Hall, Boston, Massachusetts. Jonas Chickering Monument (1872), Mount Auburn Cemetery, Cambridge, Massachusetts. Saint John the Evangelist (1875), Smithsonian American Art Museum, Washington, D.C.
Emancipation Memorial (1875), Lincoln Park, Washington, D.C.
^ a b c "Famous Sculptor Dead" (PDF). New York Times. December 12, 1911. Retrieved August 25, 2012. ^ "Sculptor Ball's Autobiography" (PDF). New York Times. October 18, 1891. Retrieved August 25, 2012. ^ Harding, Jonathan (1984). The Boston Athenaeum Collection: Pre-Twentieth Century American and European Painting and Sculpture. Northeastern University Press. p. 16. ^ "Ball's Statue of Edwin Forrest as Coriolanus" (PDF). New York Times. July 29, 1867. Retrieved August 26, 2012. ^ John A. Andrew from Boston Public Library via Flickr. ^ Daniel Webster from PaintedBunting via Flickr. ^ Official Proceedings at the Dedication of the Statue of Daniel Webster at Concord, New Hampshire on the 17th Day of June 1886, (Manchester, NH: John B. Clarke, 1886), p. 9. ^ "P.T. Barnum Monument, Bridgeport". CT Monuments. Retrieved August 25, 2012. ^ Washington Monument, Methuen, Massachusetts from CardCow. ^ Washington Monument from bigmikelakers via Flickr. ^ "Hollywood Hills: Court of Liberty". Forest Lawn. Archived from the original on June 20, 2012. Retrieved August 26, 2012. This article incorporates text from a publication now in the public domain: Chisholm, Hugh, ed. (1911). "Ball, Thomas" . Encyclopædia Britannica (11th ed.). Cambridge University Press. Wikimedia Commons has media related to Thomas Ball. Thomas Ball at Smithsonian Institution Research Information System. This page was last edited on 7 February 2019, at 05:04 (UTC).